You Supply One Ticket, We Supply Thousands Of Poolers. It only takes one ticket. 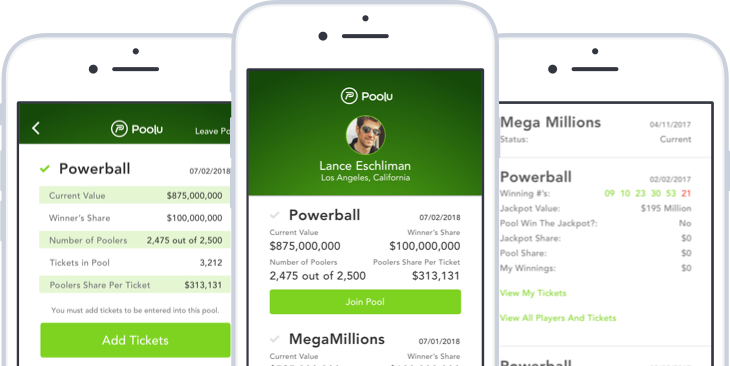 Poolu is a mobile-based lottery pooling platform that allows lottery players across the country to pool their Powerball and Mega Millions lottery tickets in a legal and safe environment. Poolu does not buy, sell, or hold any tickets, or share in any of the winnings. With Poolu, you can be in pools of tens of thousands of lottery tickets, but still walk away with hundreds of millions of dollars. Poolu pools only share jackpot winnings. If your ticket wins $7, you keep all $7. Poolu also cross checks all tickets to see if they are worth any winnings. You have a 1-24 chance of winning something in Powerball or Mega Millions — So if you won $50, we’ll let you know! Copyright © 2018 Poolu, LLC.